This was way back in February, and event day on July 30th came around very quickly indeed. 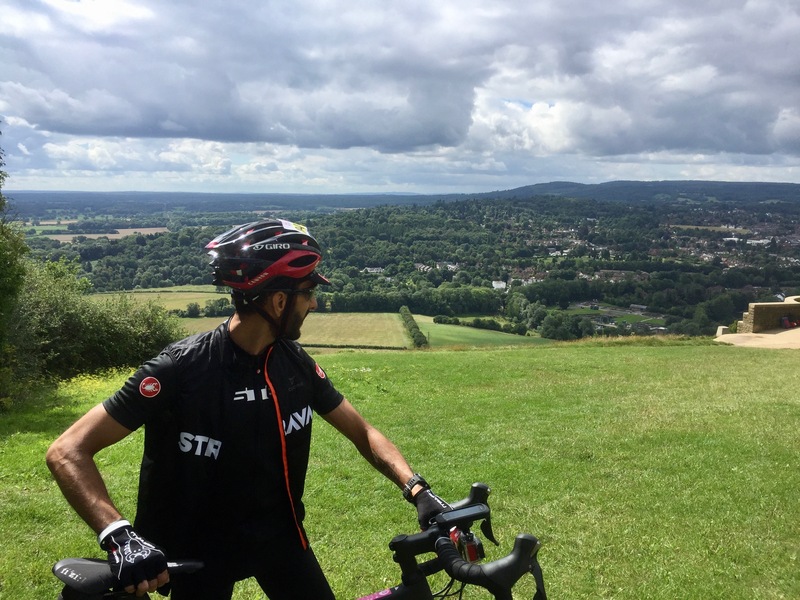 Having been struggling with a running niggle and persistent UC flare-ups, my legs felt very good over June and July, when I was planning to do a lot of cycling related training. However, I continued to run (albeit only 20 miles/week) and cross-train with my cycling, which ranged from anything between 50-150 miles/week. 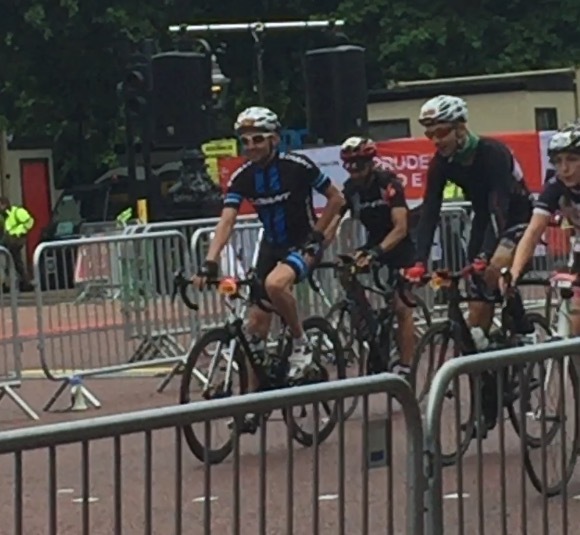 Less than I wanted to do, but sufficient to see me through RideLondon. My friends Mark and Dan also managed to obtain ballot places into the event, so we were all very excited about doing this together. 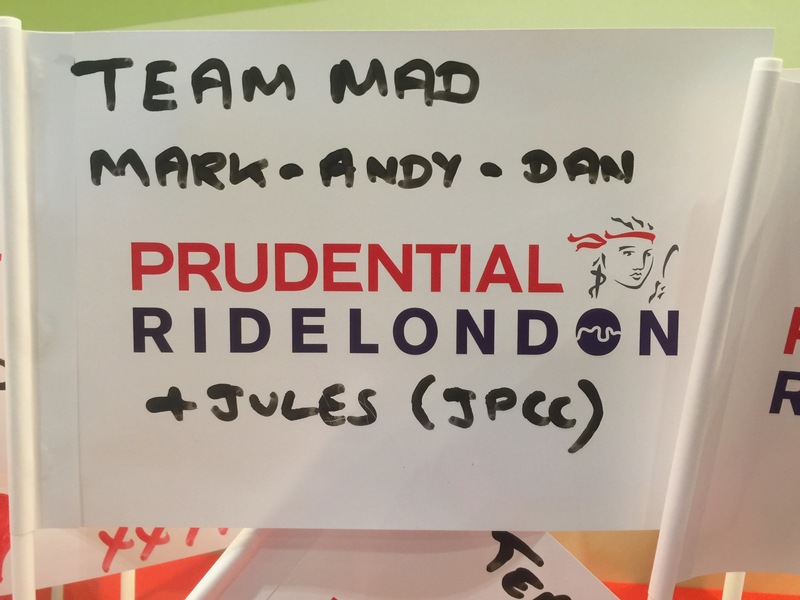 Team MAD is actually an acronym of our names; Mark-Andy-Dan! 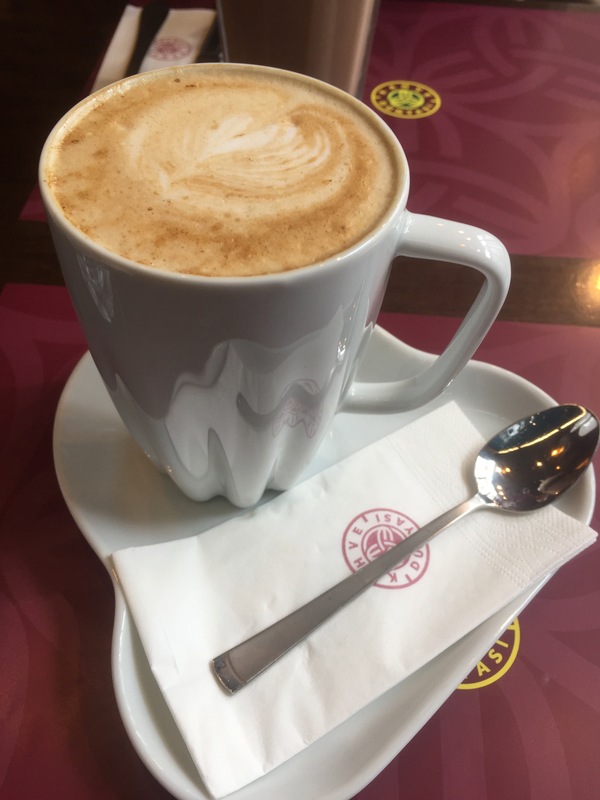 🙂 We were expecting my good friend Julian Porter (check out his cycling club at http://julianporter.cc) could join us, but unfortunately, he could not make it down at the last minute for a few reasons. I am hoping to see him at the GARMIN Ride Out in the New Forest in a few weeks, and will be posting a report on that, too. 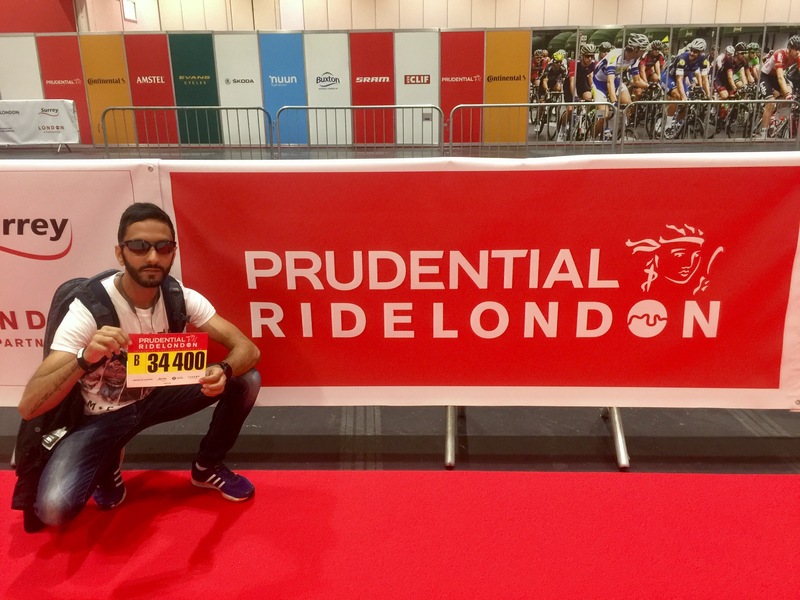 I went down to the expo at the Excel Centre in Docklands, London on the Friday (2 days before) the sportive with Sania to collect my race pack. Not much there to see, but I did plant a couple of flags for Team MAD and ELR. It was an early start indeed! My wave was “yellow B” and I have absolutely no idea how the organisers decide your wave colour (one of 6) and letter. But I made my way to Stratford for my 6:32 wave start. Waiting for Mark and Dan to turn up, we ended up starting around 7am instead. It took around 15-20 minutes after entering the start funnel before we actually set-off. The start was very flat down the A12 and into central London. It was great to be riding on a very wide dual carriage way. We passed Canary Wharf and were soon into the City of London. Cycling on closed roads and seeing sites like the Tower of London and Westminster Abbey were simply amazing. I mostly felt ‘okay’, although my quads felt rather tight from the moment we started. Not entirely sure why, as I had an easy training week (22km of running / 10 miles of Zwift) and 2 complete rest days before the event. We then quickly approached Richmond Park. 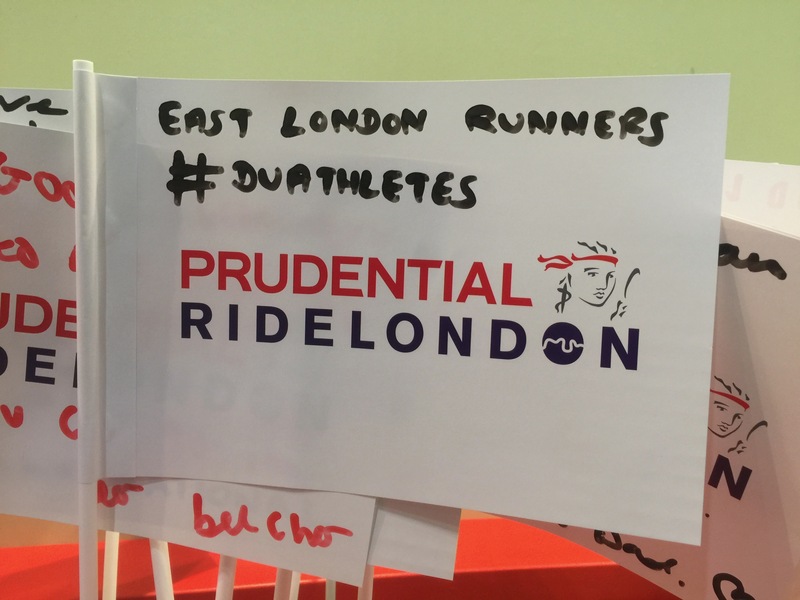 It was great to take in the sights and memories of the London Duathlon (the only times I have been here before) flooded my mind. Shortly after exiting, we headed into the Surrey countryside. This was an incredibly beautiful part of the course, and having never cycled here before, was in awe of the scenic views. We made our first stop at the 38 mile hub to fill our bottles, relieve ourselves, and grab some nutrition. We probably stopped for longer than we should have (~15 minutes) but were soon on our way again. The first climb of the ride was Newlands Corner (at 48 miles), which was not bad at all. We then finally arrived at Leith Hill. Now this was the climb that I had heard so much about. Apparently, the summit is the second highest point in South East England (after Walbury Hill), and at over 297m high, it is even higher than the Shard! Now I normally like to get out of the saddle, go in a high gear/low cadence and blast my way up. But whenever I tried to get out of the saddle, my quads were cramping up a little. So instead, I went into my lowest gear (11-28 cassette /. 52-36 chainring) and kept my cadence up (>70 rpm). I overtook a great deal of cyclists on the climb here, and there were people also walking their bikes up, which gives an idea of the scale of the climb. The hill was deceptive; each time I thought the summit was in sight, I was greeted with another climb. This was actually a psychological motivator for me, as the climb was broken up into stages. I got to the top and met-up with Mark and Dan here and we had a brief chat about the climb before descending down. Shortly after at mile 58, we reached the gorgeous and scenic Box Hill. This was actually a lot easier than Leith Hill, as the gradient was not as steep, and the road was a lot smoother, too. Also, there were signs on the floor to keep you motivated, and spinning up was a joy. We were actually chatting the entire way up, comparing the course to Zwift, where I have done the ‘virtual climb’ many times. Once we finally reached the summit, we just had to stop to absorb the breathtaking views at the Salomons Memorial viewpoint. After taking a few photos here, we continued with a couple of minor climbs and then began the descent down. We were now on our way back into London from Surrey. It began to rain down on a few sections, but fortunately, the shower was not long lasting. We stopped at the next hub at 75 miles for some further nutrition and quick chat about how the ride was going, etc. before setting out again. The next 20 miles were fairly flat, so we could pick-up the pace a little again until there was the final again incline at Wimbledon Hill, which really was nothing sinister at all. Once we got to the 91-mile point at Wimbledon, we knew that the ride was almost over, and Mark seemed a little disappointed! 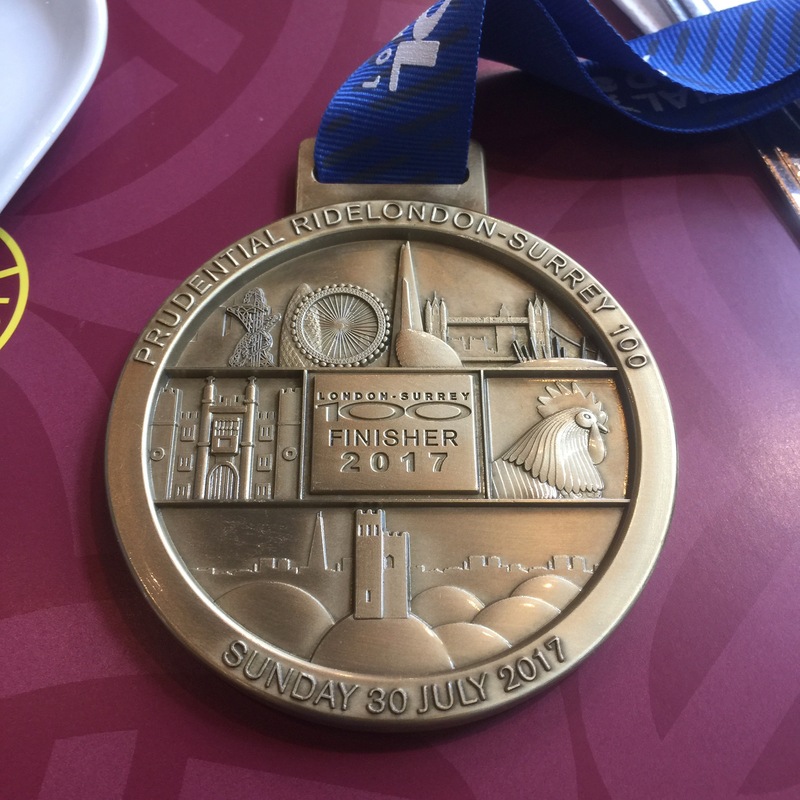 The final miles were epic, and we were talking about the finish line and engaging in other banter before hitting central London. Cycling down the Embankment on closed roads was a surreal experience, and approaching Charing Cross just before cycling down The Mall was simply amazing. Mark, Dan and I all shook hands as we made it down the final stretch before crossing the finish line. We got off the saddle and wheeled our bikes down and before I knew it, I had a huge, chunky medal placed around my neck. Awesome! This is arguably one of the most impressive medals I have ever ‘earned’, and definitely felt worth it after the ride. Mark had to head off home (for his anniversary dinner) and Dan was cycling back with him. So we said our farewells and I then met-up with Sania in Green Park where she took a picture of me. Although I thoroughly enjoyed the ride, my tummy had been in knots throughout as I’ve been having a rough patch; emotions were of feeling accomplished, albeit a little drained. 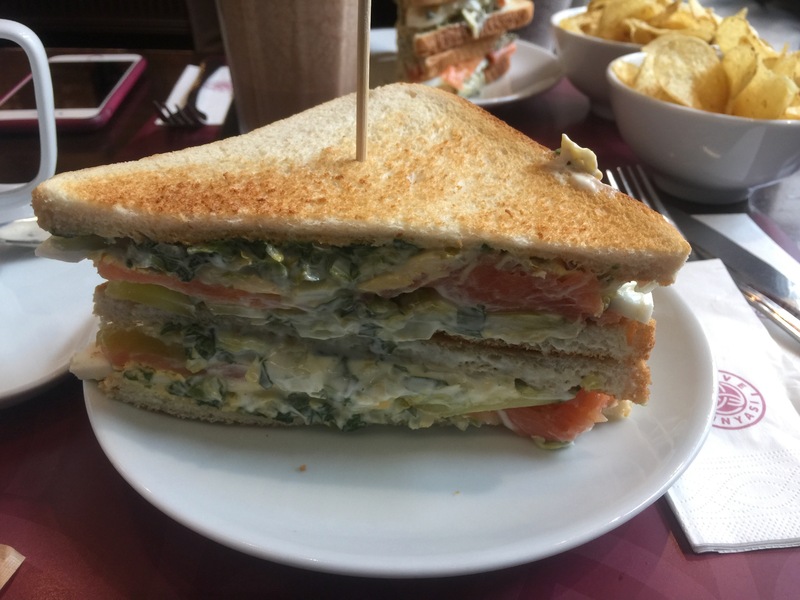 We then went for some lunch before walking around for a bit and heading home from Embankment station. Conclusively, I really enjoyed the day out on the saddle. 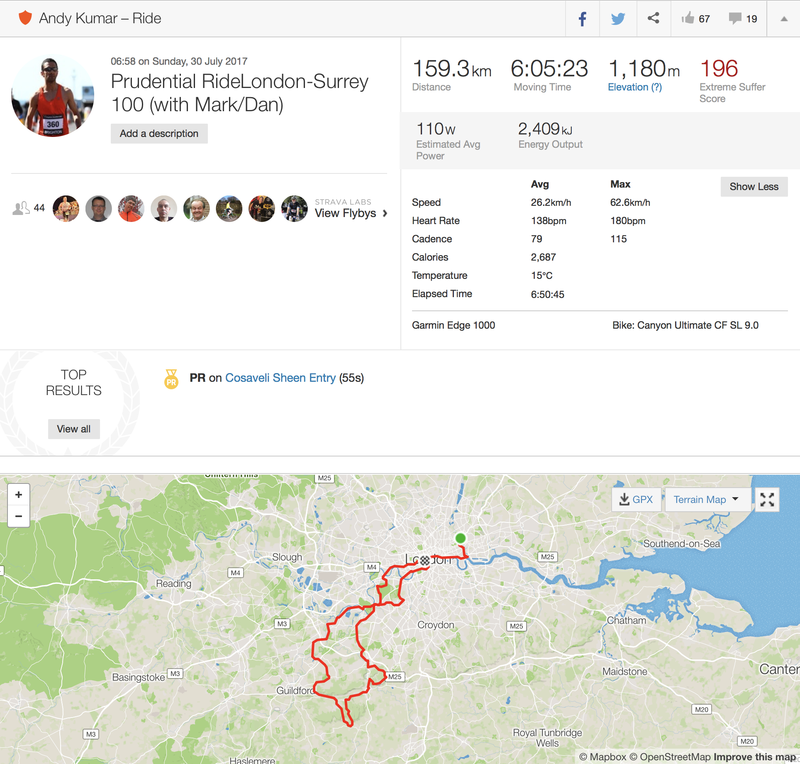 The aim for me personally was to get around, complete my first ‘Century ride’ and to *not* aggravate my gluteal niggle (which seems to be resolved now) or even worse, do any other damage. Two days on as I write this, I am happy to report that the legs feel great! Virtually no DOMS and feeling ready to ramp up the running miles again. I will be taking it easy this week, with around 13miles of running and perhaps a bike ride on the weekend. I have the Pride 10k next weekend, Garmin Ride Out on 1st September and then the London Duathlon shortly after. Oh, and not to forget the Royal Parks HM on October. I am ‘really’ looking forward to this one, as it will be my first Half Marathon in over 2 years! Okay, I was a pacer for the Royal Parks Half last year, but this was obviously not a race for me. 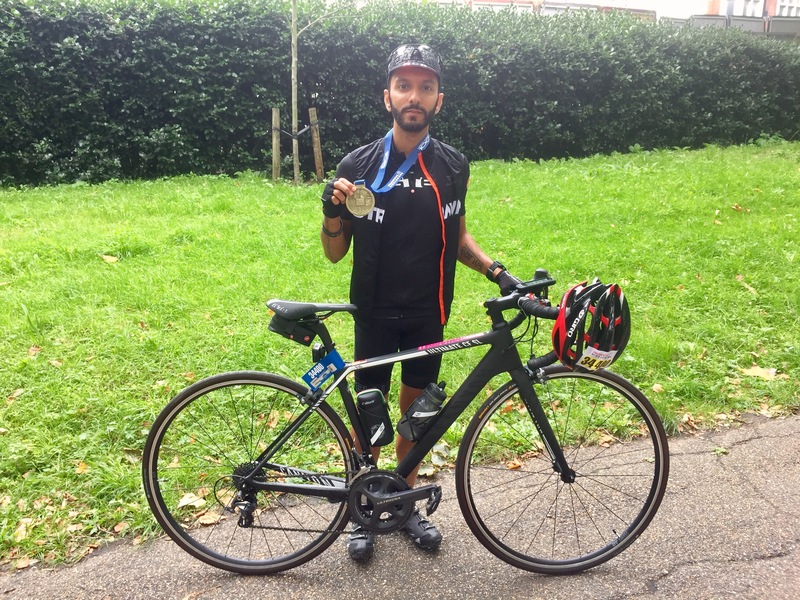 This ride was done for Crohn’s and Colitis UK. If you felt inspired, please donate to this invaluable cause. Thank-you! Note: I have some ride footage which I am in the process of editing, and will upload this shortly. Loved that you got to do it with friends as well as it makes it so much more special. 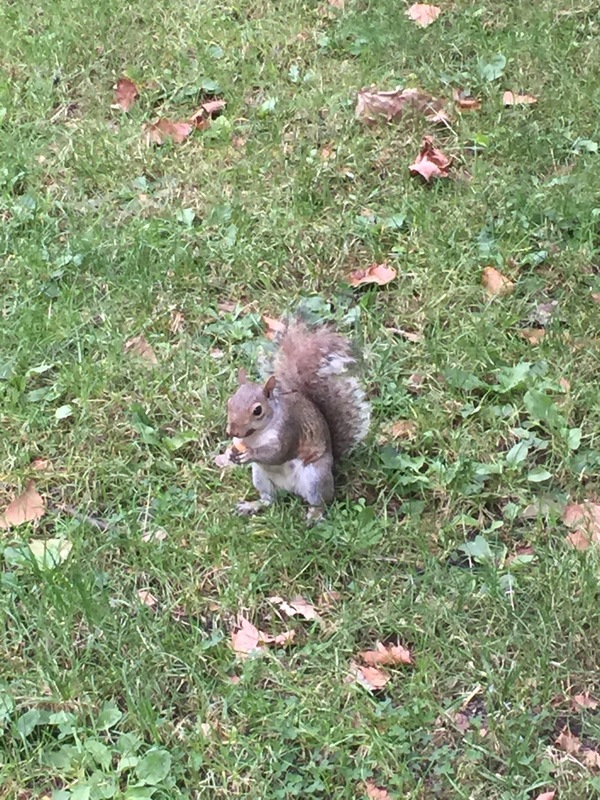 Well done and good luck in the Royal Parks half.